Ampthill Town opened their home league fixtures in great style this week when they returned to winning ways with two well earned successes. 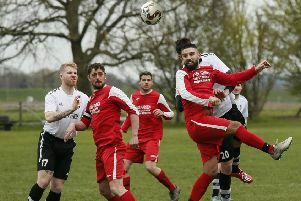 Following an opening day win at Hatfield they lost their next two away games, but returned home to beat Broadfields United 4-1 on Saturday and Arlesey Town reserves 3-1 on Tuesday. Clarke clipped the ball past the advancing keeper when McCabe provided the pass. Broadfields rallied and from a flag kick Rex Komina lashed home an overhead leveller. But Ampthill’s lead was restored on the half hour mark when Clarke was brought down and Ashley Mead scored from the penalty spot. Before the break Jamie Cerminara miscued two chances to add to the lead and Arrun Ramsey had a header tipped over. Town’s defence was examined in the early stages of the second half but they stood the test. Clarke scored a spectacular third from 30 yards ten minutes from time and late on Jamie Cerminara added the fourth. Keeper Sean Green made two fine stops in the dying minutes. Ampthill beat near neighbours Arlesey Town Reserves 3-1 on Tuesday with early chances falling to Nathan Mallett and Clarke before Ben Butler had a header cleared off the line. Town had to wait until just before the break when Jamie Cerminara beat the keeper with a sharp finish. Clarke increased the lead in the 65th minute and though the visitors pulled one back Neil Mallett restored Town’s two goal advantage to earn another three points. Town host Harpenden on Saturday.